My 5 foot ten inch frame has always seemed more naturally built for basketball, yoga or cross country running but I found a sport 30 years after those dreadful high school phys ed classes that is absolutely perfect for me at this point in my life. Ladies…I am keeping my day job but the sport of rowing is one which has grabbed me by surprise and has triggered a new view on “health”. I made a decision that it was “time” to reinvent my life, including health, so I could sustain both weight management and fun! In essence, I had to re-program how I saw health fitting into my life. Was it just the desire to loose weight and get in my “skinny jeans”? Not really, but that was a start. Approaching 50 years old this year, I found that my latent desire for physical competition was brewing like a tempest tea pot and that the creative demands of my marketing consultancy needed more than just sleep to really thrive. Yes, not only loose 20 pounds but regain a sense of energy and sustained interest in being more physically active. Does that sound like you? Are you looking for more energy and more vitality…and doubtful that diet pills, a new gym routine or new vegan diets will change anything? Do you see yourself as the midlife equivalent of your high school past? Does your poor body image still prevail? 1) DISCOVERY: What I discovered began on a learn to row vacation I took with my husband up to Craftsbury Vermont, where the world-reknown outdoor center started over fifty years ago. I thought it would be a great way to spend time with my husband, who had been rowing for more than 30 years. Since world class athletes also train and practice at this center, I completely lowered my expectations as to what I could achieve in a week’s time there. And, because I was open to the experience of being a midlife novice, I was much more relaxed and actually learned much more than if I had pressured myself into performing. 2) ACTION: When I returned from this vacation, I immediately sought to sustain my motivation, using the passion for the sport to get into shape. This meant I needed to both loose weight – initially – and gain muscle mass. I lost 30 pounds by first joining a spin class and getting into better cardiovascular shape. I also decided to join a local rowing club, and began a learn to row program within three months of my Craftsbury learn to row vacation. And, I learned to row with other women who were local – many over 40 – who were, and still are, practicing two to four early mornings each week on the Norwalk River. 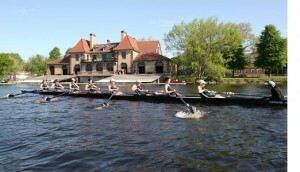 Usually I rowed in a “quad” where four women row together – each with two oars. With my long arms, I was frequently asked by our coach to be in the first seat which is the stroke seat. It’s fun to be in the lead but it also means there is no one to follow! All the other rowers are following the stroke so you need to focus and concentrate. You also need to relax. 3) RELAX: I don’t think you can appreciate how important recovery is in our lives today unless you start rowing. The recovery allows your body to relax and the boat “runs” underneath you, effortlessly. Of course, that all depends on your ability to technically row. However, my 20-year long yoga practice came in handy because in order to do well with rowing you must balance “drive” with “recovery”. These two opposites work well with me, because I use yoga breathing on the recovery, and find that this breathing mechanism simply reduces the feeling of stress in my body. Even better, wellness experts do recommend exercise as an evidence-based stress-reducer! Skinny jeans aside, there’s so much more to health for me today. We’d love to know! How Have You Reinvented Health? Email me at kelley@kc-health.com and tell me your story to be featured on Real Women on Health! P.S. I have sustained about a 20 pound weight loss for two years now…it’s still a process of discovering new opportunities daily to make incremental changes that make a difference over time! Kelley Connors Has Written 6 Articles For Us! I’m a health care marketing consultant and social media strategist working virtually with partners on the east and west coast. Here’s my women’s blog, Real Women on Health! and my new marketing to women blog. I love to row crew with the Maritime Rowing Club in Norwalk, Connecticut and enjoy the friendship of a dozen ladies at the club who meet the early morning twice or three times a week.